Who invented the Calculator? The name of the person credited with inventing the mechanical Calculator is Blaise Pascal (1623 - 1662). Blaise Pascal is not only famous as the French inventor of the Calculator but also as a Christian philosopher, physicist, mathematician and author. When was the Calculator invented? Blaise Pascal invented the Calculator, called the "Pascaline" in 1642, during the Renaissance period of inventions (1350 to 1700). Definition of the Calculator: The Calculator is defined as a small, hand-operated mechanical or electronic machine that is used to make mathematical calculations. Fact 1: Who invented the Calculator? The mechanical Calculator was invented by Blaise Pascal in 1642 during the Renaissance era of inventions (1350 to 1700). Fact 2: Who invented the Calculator? Prior to the invention of the Calculator in 1642, significant other inventions were made to make this development possible including the invention of the ancient abacus, the manually-operated calculating device called Napier's bones, the slide rule and the "calculating clock". Fact 3: Who invented the Calculator? The ancient Mesopotamians invented the Abacus c.2700 - 2300 BC as a fast counting system using addition and subtraction to keep track of the numbers and counts of grain, cattle and sheep. Fact 4: Who invented the Calculator? Knowledge of the abacus reached other ancient civilizations and the Chinese developed the 'Suan Pan' abacus not only for addition and subtraction purposes but also for multiplication and division calculations. Fact 5: Who invented the Calculator? In 1614 the Scottish born Renaissance scholar and mathematician John Napier (1550 - 1617) invented a manually operated calculating device referred to as "Napier's bones". Napier’s ‘bones’ or ‘rods’ consisted of 9 different 'bones' or rods with numbers on for multiplication purposes. John Napier also invented logarithmic scales. Fact 6: Who invented the Calculator? In 1618 Edmund Gunter (1581-1626) developed a mechanical device called 'Gunter's rule' for multiplication and division purposes using dividers, which was the forerunner of the slide rule that was invented by William Oughtred (1574 -1660) in 1622. Fact 7: Who invented the Calculator? Willhelm Schickard (1592 -1635) invented a calculating machine, called by his contemporaries the 'Speeding Clock' or 'Calculating Clock', the first mechanical calculator that used gears for the addition, subtraction and multiplication of six-digit numbers. Fact 8: Who invented the Calculator? Pascal's Calculator, known as the arithmetic machine and later as the Pascaline was invented by Blaise Pascal in 1642 when he was 19 years old. Fact 9: Who invented the Calculator? The inventor of the mechanical Calculator, Blaise Pascal, was born on 19 June 1623 in Clermont-Ferrand, Auvergne, France and died on 19 August 1662. Fact 10: Who invented the Calculator? The early years of Blaise Pascal were spent in Clermont-Ferrand, Auvergne, France where he was raised by his family. Blaise Pascal was provided with an excellent home education by his father, Etienne Pascal, was presiding judge of the tax court at Clermont-Ferrand. Fact 11: Who invented the Calculator? in 1642 when Blaise Pascal was just 19 years old he invented the mechanical Calculator to help reduce his father's workload of tax computations. Fact 12: Who invented the Calculator? The Pascaline machine was received to great acclaim by the scientists and mathematicians of the era. Pascal’s contemporaries later claimed it was the first digital calculator because it operated by counting integers. Fact 13: Who invented the Calculator? The Pascaline calculator could add, subtract, multiply, and divide and was housed in a compact brass box that measured 13 inches by 4ins by 2 ins (350mm by 125 mm by 75mm). The Pascaline had metal wheel dials that were turned to the appropriate numbers using a stylus. The answers appeared in boxes in the top of the calculator. Fact 14: Who invented the Calculator? The Pascaline was the first commercially produced calculator and it came in both decimal and non-decimal varieties. Blaise Pascal sold twenty of his machines but ceased production in 1654 because they were not cost effective to produce. Fact 15: Who invented the Calculator? Other calculating machines were developed but none became commercially viable until Charles Xavier Thomas de Colmar (1785 - 1870) developed his simplified 'arithmometer'. The 'arithmometer' was invented in 1820 and manufactured from 1851 to 1915. It could perform long multiplications and divisions and was reliable enough to be used daily in an office environment. Fact 16: Who invented the Calculator? Frank S. Baldwin (1838-1925) of St. Louis, Missouri, invented a pinwheel calculator in the United States of America in 1872. His calculating machines were based on “pin wheel” or “variable cog” mechanisms. Frank S. Baldwin also designed a simple adding device, another Arithmometer in 1874 (US patent number 153522). Fact 17: Who invented the Calculator? In 1884 American inventor Dorr E. Felt (1862-1930) invented the Comptometer, the first successful key-driven adding and calculating machine and the Comptograph, the first printing adding machine. Fact 18: Who invented the Calculator? In 1891 William Seward Burroughs invented a nine-digit adding device with a printing mechanism, designed to record only the final result of calculation and the large scale production of his machines began. In 1906 William Seward Burroughs claimed that he had sold 40,000 of its machines that year and that 90% of all adding machines were sold by Burroughs. Fact 19: Who invented the Calculator? Up to the 1960's calculators were complicated motor-assisted mechanical adding machines with no other electronic parts. In 1963 the Bell Punch Co., Uxbridge, England invented the world's first electronic desktop calculators that used cold-cathode vacuum tubes and numerical display tubes. Fact 20: Who invented the Calculator? In 1962 the Philips company produced their prototypes of electronic calculators and in 1964 the Sony Corporation introduced the world's first all-transistorized (no vacuum tube) desk-top electronic calculators. Fact 21: Who invented the Calculator? The electronic calculators began to replace the electro-mechanical machines and in 1965 Texas Instruments took a massive step forward by producing a prototype of the "Cal-Tech" hand-held calculator. The invention of the electronic hand-held Calculator was made in 1967 by the American inventor Jack S. Kilby and by the 1970's the first battery-operated "hand-held" calculators were sold. Fact 22: Who invented the Calculator? The sales of the new "hand-held" calculators soared and as initial prices decreased they became popular with both students and office workers alike. Fact 23: Who invented the Calculator? The First calculator to use a microprocessor, the Intel 4004, was developed in 1972 and in the same year Hewlet-Packard introduced the scientific pocket calculator. Fact 24: Who invented the Calculator? In 1976 Calculators with Liquid crystal displays (LCD) were introduced and the first calculators equipped with solar cells, used to charge the internal batteries, were also developed. Fact 25: Who invented the Calculator? 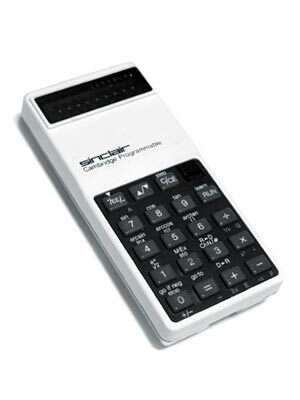 In 1980 Sharp's development of the hand-held calculator led to the first hand-held computer with a QWERTY keypad. Fact 26: Who invented the Calculator? Personal computers began to be pioneered in 1976 by Steve Jobs and Steve Wozniak who jointly founded the Apple corporation and revolutionized the world of Computing. Personal computers now come with a calculator utility program that emulates the appearance and functions of a calculator.